Localization is automatically displayed to users based on the locale of the person logging into the Portal. Localization of number formats and dates provides a consistent experience based on what the logged in user is accustomed to in their native locale. While locale is not the same as language, it can be related to language (for example, you can “localize” English to UK English). From a Portal perspective, a user may access a Portal in a language that is different from their locale. In this case, the user’s experience will be presented in their native locale, but the language will be displayed based on what is configured by an administrator. Simply put, “what is displayed” (the language) is controlled by an admin, while “how it’s displayed” (locale) is automatically adjusted for the user. When using the default language (English en-us), no further localization is required. Language packs are not provided, and the assumption here is that a single language will be displayed throughout the Portal. When it comes to menus and reports, menu items and report titles require manual updates by an admin before it can be configured for a specific language. By default, all menus and reports are “localized” to US English (en-us) (that is, the language of display is US English) and if language strings for another locale are desired (for example, UK English), then this will replace the previous language strings. Menus currently only support a single language, however this language may be translated or localized as described below. Go to: InterConnect Manager AddOn > Manage Menu. Select the desired application and menu. For each Menu Entry, ensure the entry’s Name field is translated. This is the link name displayed to the end customer. For Menu Entries that are Grids, Pivots or Charts, open the report Link and edit the Query columns associated with that link. 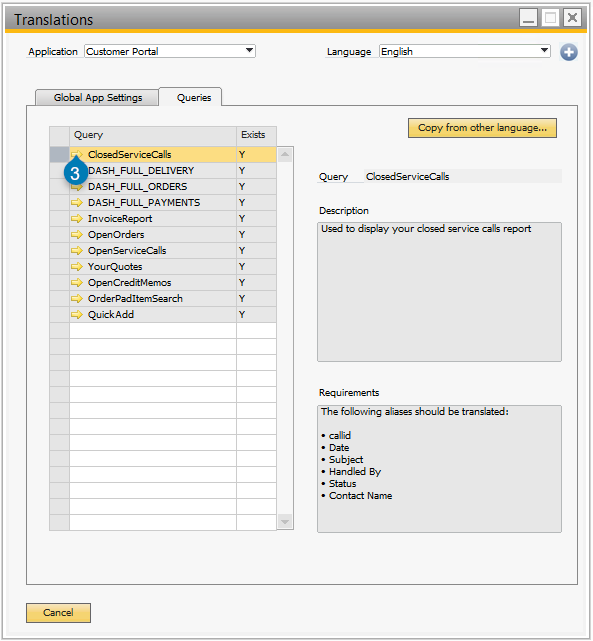 Edit the Query using the standard SAP Business One query editor. Always back up queries to a safe location before making edits. Recycle the B1WebAPI’s application pool. This will clear the cached language default for all Portals. See Recycling Application Pools for a walkthrough of this step. Recycle the Portal’s application pool. This will re-load the language default from B1WebAPI. See Recycling Application Pools for a walkthrough of this step. For Customer Portal, localization of Reports has been simplified with the Manage Translations screen. See details below. For Customer Portal, localization of Application Strings has been simplified with the Manage Translations screen. See details below. The Manage Translations utility provides a way to manage configured languages. Out-of-the-box, only one language is provided, however additional languages may be created. The default language (US English en-us) may be replaced by a different language, allowing for translation or localization in the preferred language. Currently, Manage Translations is only supported in Customer Portal. Manage Translations may be used to update Application Strings or to view/update Reports for a specific language. To open Manage Translations, in SAP Business One, go to: InterConnect Manager AddOn > Manage Translations. Warning: Exercise caution when updating User-Defined Tables. UDTs contain application data and should only be updated as instructed. Out-of-the-box, each Portal has a single default language. If a different default language is desired, it should be set at the beginning of an implementation. If a system is fully configured and the default language needs to be updated, extra steps must be taken to ensure backups are made for all configured content (namely, AppStrings files and Report queries). For the desired application, change the Locale ID. 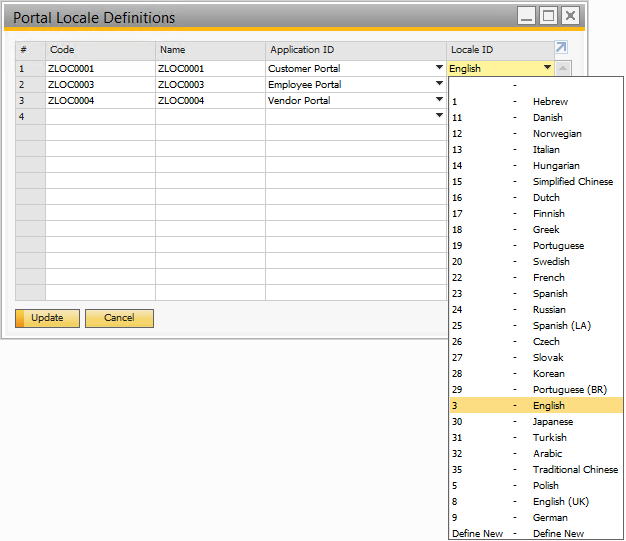 Change a Portal's default language in the Locale ID drop-down. 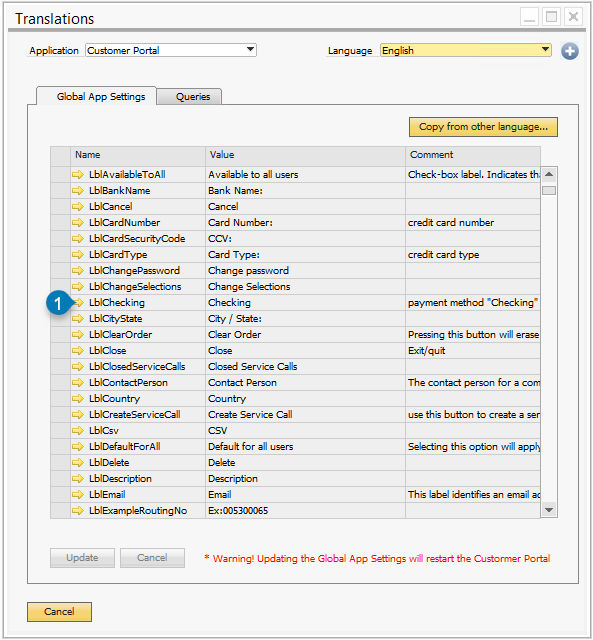 If multiple languages are required for Customer Portal, each distinct language must be added to the application languages table ZEDS_APPLOCALE and assigned to Customer Portal. Warning: Before proceeding, back up your Portal website's AppStrings.resx file. This is typically found in the website's App_GlobalResources folder. In the case where multiple languages have been configured, that language's file will contain the locale code in the file name (for example: AppStrings.es.resx instead of AppStrings.resx). Setup of multiple languages is not covered by this documentation. In the Manage Translations screen, navigate to the Global App Settings tab. The Global App Settings tab displays language strings for the selected language, such as web user-facing labels and instructions. Out-of-the-box, one language is provided (English). Edits to this language’s details can be used to apply translations or localization. Included in the Application Strings file are breadcrumb labels, which all begin with the word “Breadcrumb”, for example, BreadcrumbHome. Replace the value associated with each breadcrumb link to update breadcrumbs displayed to web users. Note: Updating Global App Settings will restart the Portal. To minimize disruption to end users, these settings may be applied after-hours, or updated offline and manually uploaded all at once. This walkthrough will demonstrate the steps necessary to localize application strings from English into UK English. Open Manage Translations: In SAP Business One, go to InterConnect Manager AddOn > Manage Translations. Open the Global App Settings tab. Configure Application Strings. In this example, we’ll change the value for LblChecking from the US value of Checking to the localized UK value of Chequeing. Press the golden arrow for the desired label. Press the golden arrow (1) to edit the LblChecking label details. Edit the Value of the label then press the Update button to apply the label change. After updating the value (1), press Update (2). When the desired edits are complete, press the Update button to apply all label changes to the web. This will reset the website and re-load the new labels. When all edits are complete (1), press Update (2). This will restart the Portal website. Warning: Back up queries before applying the changes described. This will ensure there is a "restore point" in case edits to the queries don't display the desired result. In the Manage Translations screen, navigate to the Queries tab. The Queries tab displays the queries that are required for the selected language. 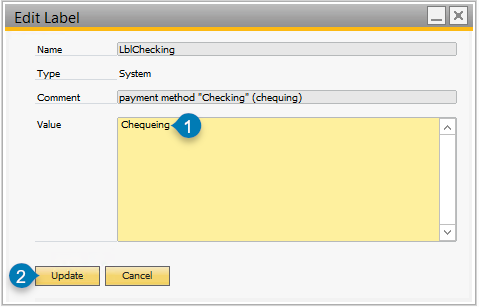 The Exists column indicates whether the query exists for the selected language (Y) or not (N). Each query will need to be edited to ensure they are localized or translated into the desired language. Select the desired query from the list. At this point, the query requirements will be displayed in the Translations pane. Select a query (1) to see its requirements (2) for translation/localization. Press the golden arrow to drill into the query details. 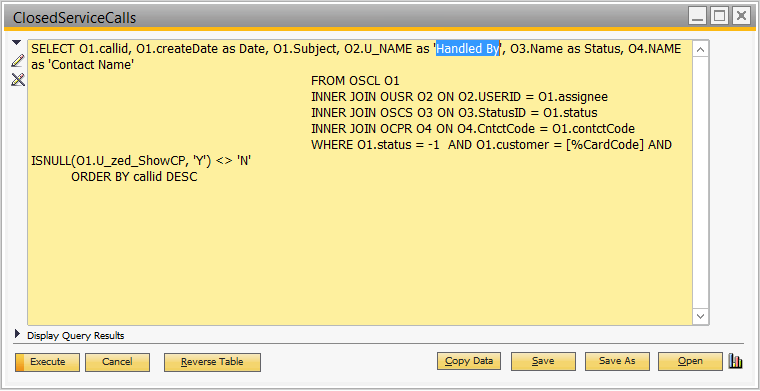 This will open the SAP Business One query editor window. Press the golden arrow (3) to drill into the query details. Before proceeding, back up the query to a safe location. 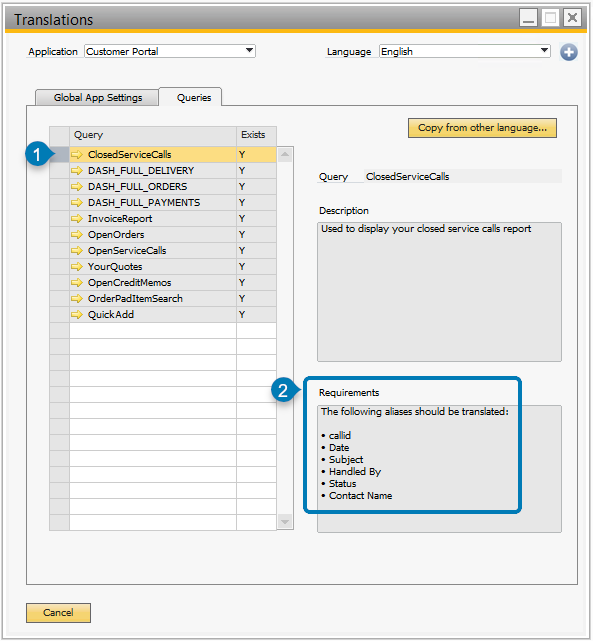 Using the query editor, refer to the Requirements pane to update the indicated query columns. Don’t update other columns, as these are required by back-end code. Edit the query column aliases and press Save or Save As. Save query edits. Note that if the query already exists, it will overwrite the previous version. Recycle the B1WebAPI’s application pool when all queries are edited. This will clear the cached queries for all Portals. See Recycling Application Pools for a walkthrough of this step. Recycle the Portal’s application pool. This will re-load changed queries from B1WebAPI. See Recycling Application Pools for a walkthrough of this step. At this point, users will see localized versions of reports. B2B Collections and Web Products may be configured in multiple languages, however this walkthrough assumes a single language has been implemented, and this language must be localized. Number and date formats display in the user’s locale automatically, however application strings for Customer Portal must also be updated in the corresponding language before B2B Catalogs can be fully localized. 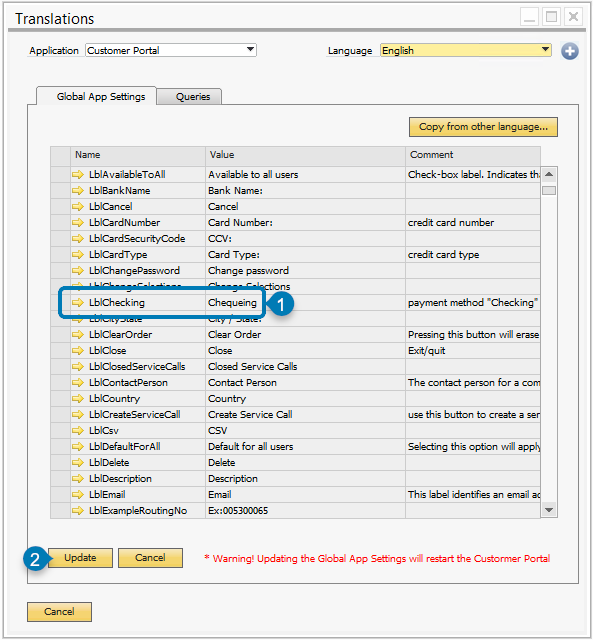 See Localizing Application Strings for a walkthrough of this setup task. The following instructions describe how to localize B2B Catalogs. In SAP Business One, go to: InterConnect Manager AddOn > Customer Portal B2B > Manage Collections. Select the desired language from the upper-right drop-down. If the desired language is not available, it may be configured as described in Assigning a Different Default Language. Ensure the proper Store Fronts are assigned to the collection that grant access to the target audience. Ensure all desired Web Products have been configured in the desired language. A collections language is used to filter configured Web Products of the same language. In SAP Business One, go to: InterConnect Manager AddOn > Customer Portal B2B > Manage Products. Ensure this Web Product is assigned to a Collection which also has the same language configured. This must be managed within the Collection. When Web Product details are complete, Update the Search Index to apply the changes immediately. If this is not done, there may be up to 10 minute detail before the web product details are displayed to users. Store Fronts provide details about the layout of a B2B Marketplace web store. Within a store front, language-specific labels may be configured to tailor the experience to a specific language. In SAP Business One, go to: InterConnect Manager AddOn > Customer Portal B2B > Manage Store Fronts. Edit the desired Store Front. On the Labels tab, select the desired language from the Locale drop-down on the right. Configure language strings for each template by selecting the template from the left-hand drop-down. Media such as product images may have language-specific content. To assist with setup of localized content, Media Manager may be used to upload localized versions of product images or other supporting media. See Media Manager for B2B Marketplace.